Happy Back to the Future day! Today is the day that Marty McFly, Emmett "Doc" Brown and Jennifer Parker targeted in their time travel from 1985 to 2015 in the sci-fi film trilogy's second installment in 1989. 4:29 PM today, in fact. The future, as imagined in 1985, offered self-lacing sneakers, hover boards, personal fusion devices running on garbage, and a winning Cubs team. While these predictions have not yet come to pass (sorry Cubs! ), flat-screen TVs and Skype have. But could Robert Zemeckis and his writers have imagined lightweight GPS-guided robotic drones that can be controlled with a smartphone, and whose parts can be printed using a 3-D printer? How about drones outfitted with multi-spectral cameras that produce a mosaic of digital photos that are assembled automatically in software to create extensive ultra-high resolution maps of vegetation? “Doc” Jason Karl does this down the hall from me. The future, I expect, will always be a blend of the predicted, the imagined, and the completely unimagined. And it is great fun to think back to 1985 and compare what you expected to have versus what you actually have now. I especially enjoy doing this, often vicariously, with old photos of landscapes. Interpretations of repeat photos are immensely useful for understanding ecological dynamics. Historical trajectories of change underpin land management and land use policy at a societal level. But they can also alter individual perceptions of how landscapes work. There can be surprises, good and bad. Your assumptions will usually be overturned. This is science at a personal level. So, in celebration of Back to the Future day, here are some photos of landscapes (mostly from the Jornada Experimental Range and surrounding parts of the Chihuahuan Desert of New Mexico) then and now. These photo sets circumscribe the primary temporal patterns in the region that we have detected. I also include an example from the Chaco that I wrote about earlier. Imagine what observers were predicting in the left photos (I did in some of these). In the bottom set, middle picture, I don't have to imagine. I threw in some 1985 starting points when I could. Permalink Submitted by dustin.detweiler on Tue, 10/27/2015 - 14:38. I'm guessing the mesquite can be found on shallow soils or on soils having a diagnostic horizon or a significant textural change creating interflow or lateral water movement at a shallow depth. With this in mind, I wouldn't be surprised if the noncalcareous clayey soil above had a strong dense argillic horizon (or some other horizon) compared to the calcareous silty clam loam where water movement downward through the calcareous silty clay loam soil profile is unhindered and deep percolation occurs. Other considerations are the sites' proximity to orographic effects. Does the noncalcareous clayey soil site receive additional moisture from the nearby mountains while the calcareous silty clam loam site, because of the topography, remains separated from moisture related to mountain runoff? Permalink Submitted by Brandon Bestelmeyer on Tue, 10/27/2015 - 18:38. Permalink Submitted by dustin.detweiler on Wed, 10/28/2015 - 11:28. Thanks for the info. Soil-based explanations are problematic. Here in the Mojave mesquite is usually associated with playas and in many cases mesquite traps moving sand. The typical soil pit will tell you that the soil the mesquite is growing on is a pile of sand but it is unlikely the mesquite is growing where it does solely because of the sand. Most sources will tell you that mesquite growing in the Mojave is usually an indication of a water table that is relatively close to the surface. For this reason, I was guessing the soils were shallow or somehow producing interflow. Mesquite on soils with high carbonates in our area is definitely not the norm. I took a cruise through our database and, for what it's worth, I did find an ecological site with fairly productive western honey mesquite on soils with a calcium carbonate equivalent of up to 30%. The soils are coarse-loamy, mixed Calcic Petrocalcids. The ESD is Gravelly Skirt (R030XY164CA). Our database doesn't indicate the ESD is very widespread, less than 400 acres. Permalink Submitted by Brandon Bestelmeyer on Thu, 10/29/2015 - 11:33. Thats interesting. Here mesquite is most abundant on loamy sands to sandy loams with little surface carbonate, but carbonate at depth. (Water table at about 300 feet). Run in areas (what Curtis monger called 'playettes' on sandsheet landforms) can have dense mesquite. But its also moving into more loamy soils. I guess that plant-soil relationships are somewhat climate dependent. Permalink Submitted by aspidoscelis on Sun, 12/20/2015 - 20:14. Permalink Submitted by Brandon Bestelmeyer on Tue, 12/22/2015 - 10:47. I think a clear case of shallow sandy, eroding shrubland state. The shallowness in some cases may be basalt upon which there is a layer of indurated or fractured carbonate. Why mesquite and not creosotebush? Based on some of our data, if the top horizons do not have lots of fine soil carbonates, then you can get mesquite. Even with caliche fragments, the soil fraction might have an effervescence of very slight or slight. 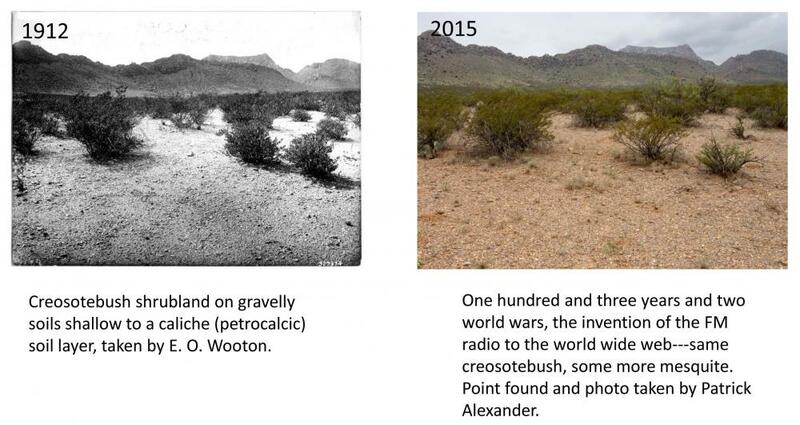 Creosotebush soils are typically strong or violent close to the surface. Permalink Submitted by aspidoscelis on Tue, 12/22/2015 - 10:59. Gotcha. I'm not used to thinking about fine soil carbonates, just the big chunky stuff. I need to start remembering to carry hydrochloric acid with me.